After dropping off our bikes we had another gear related errand to run. A few days back when we were camping, we got the stove out and tried to pressure the fuel cannister. The pump was just moving freely and not creating any pressure. Taking it apart, I saw that the rubber cup on the plunger had dried out and got stuck at the bottom of the chamber, almost certainly because we hadn’t used it for a few months. I got the rubber part out and re lubricated everything so that it was just about working ok, but it was a reminder that we’ve been meaning to buy the MSR spare parts and maintenance kit. Up until now, not having a stove wouldn’t have been too bad as we’ve always been close enough to shops and or restaurants. But the next leg through China and westwards will take us through much more remote areas, where an unserviceable stove would be a much more serious problem. So, we took the subway, then a taxi to Thailand Outdoor Shop (http://thailandoutdoorshop.com/) in the north of the city, which is Thailand’s MSR distributor and an all round awesome camping shop. They had the kit we needed, and we also picked up a 10 litre dromedary bag for carrying water when we’re in more remote places on the next part of the tour. 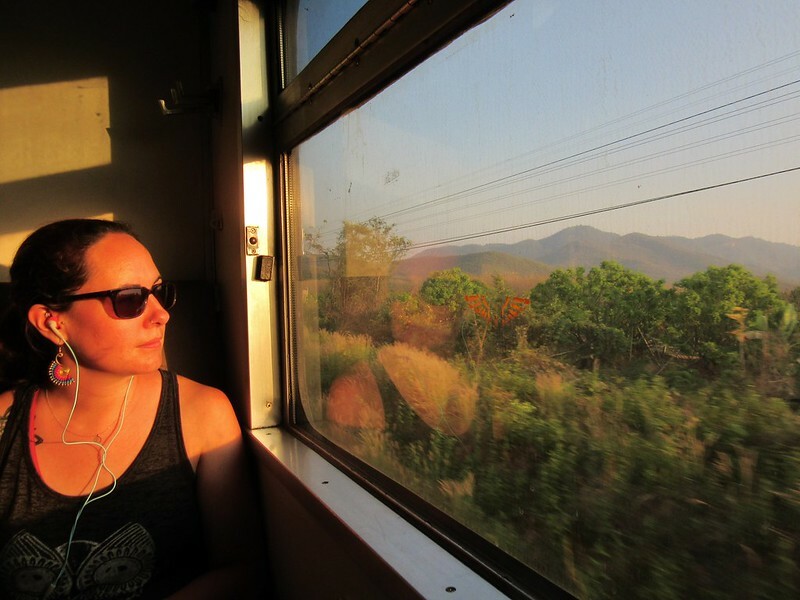 The following day, Clare’s birthday, I had lined up the special treat of a 13 hour sleeper train to Chiang Mai. Ever the romantic, I also took her along the Khao San Road market stalls and haggled over a few bits of jewellery and some yoga pants for her birthday present. Lucky girl. 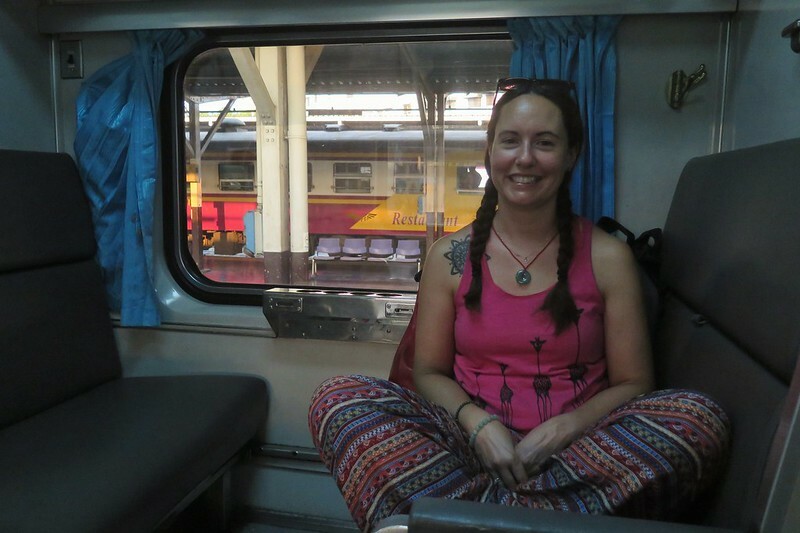 Before the train, we’d arranged to meet up with Todd and Vicky (from our time in Siem Reap) again. 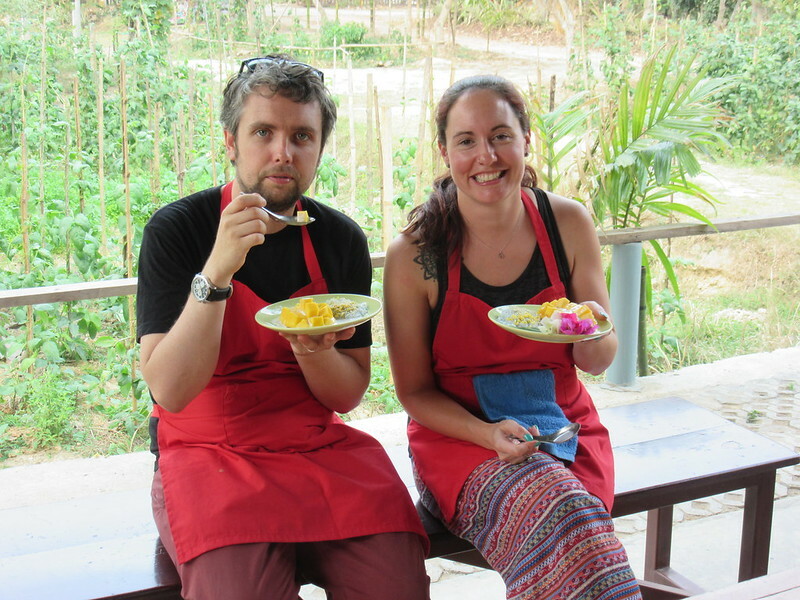 They’d been in Vietnam since leaving Cambodia and the timing worked out for us to head up to Chiang Mai together. 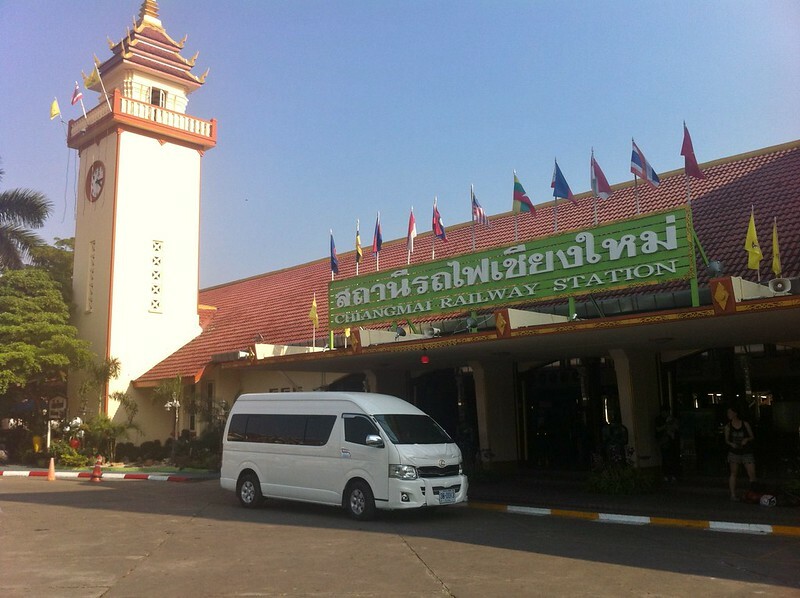 We left Hualamphong station at 6pm and arrived at 7 the following morning after a reasonably good night in the 2nd class sleeper car. 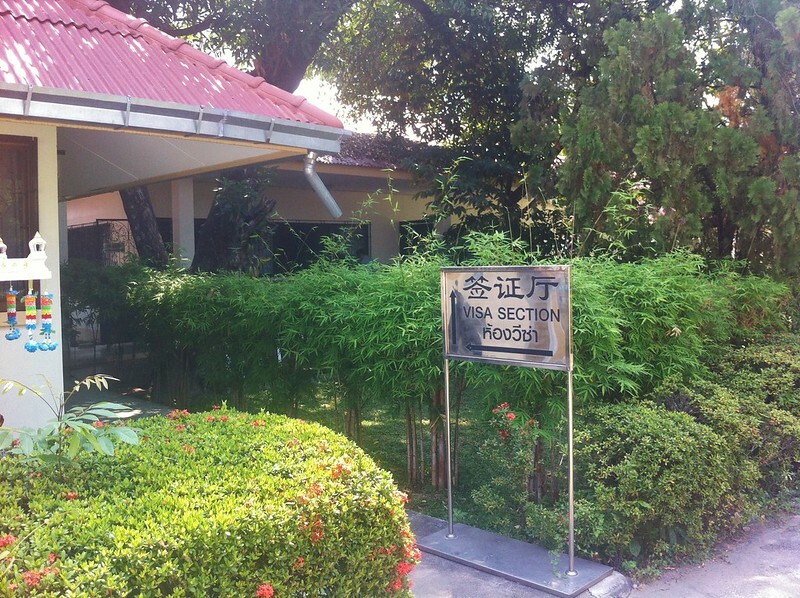 Our first mission when we arrived was to get straight over to the China Consulate. We needed to get our China visas for the next stage after Laos. I’d heard stories of long queues and unhelpful staff at the Bangkok visa centre, so had initially thought we’d try and apply at the embassy in Vientiane (Laos). 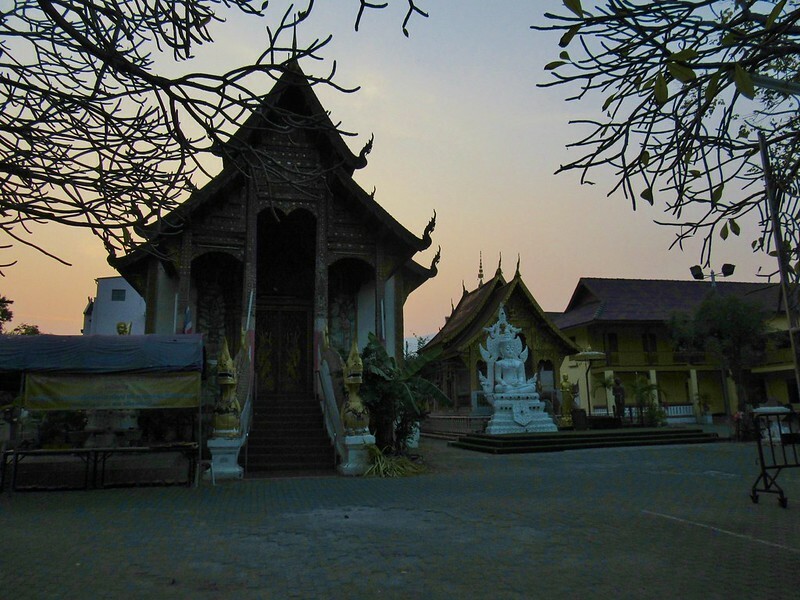 But, I remembered reading somewhere that Chiang Mai had a good reputation, so I thought we’d give it a go there. I’d prepared all the documents, printed refundable flight tickets and hotel bookings, and created a realistic looking itinerary for a 90 day stay. At the consulate, we took a ticket and waited all of 5 minutes before being called to hand in our applications. Unfortunately they immediately said 90 day visas weren’t available, so we’d be getting 30. It seems like this is a common story all over now, with shorter visas being issued which can be extended from within China. We’d sort of expected this, so the 90 day application was a bit of a long shot. We returned the following morning, and after 20 pleasant minutes waiting in the visa building’s garden, we were presented with our 30 day visas for 1,900 baht, or £38. A fairly painless China visa experience, much quicker and cheaper than both the London (rip off) visa centre and Hong Kong’s CTS agency. 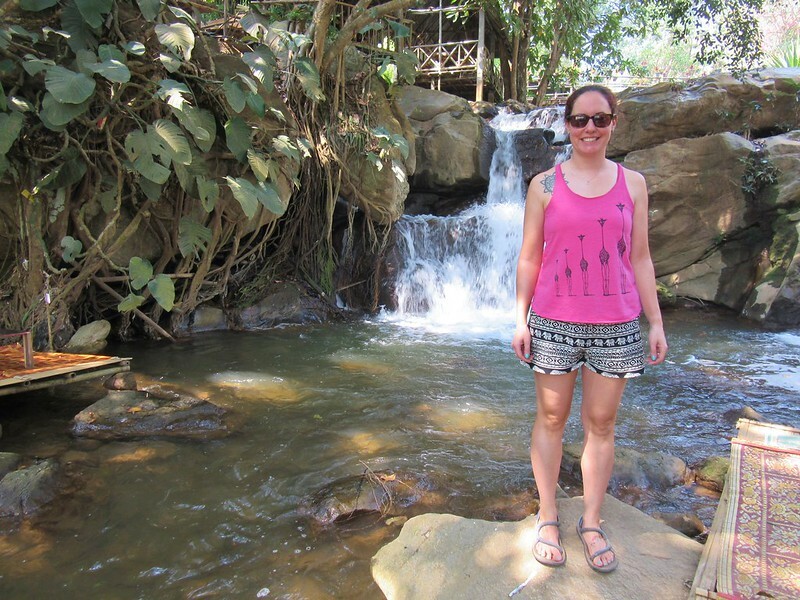 Then we had five days in Chiang Mai relaxing and exploring the town and nearby mountains. One highlight was doing a cooking course, a very kind birthday present from Clare’s sister, Emily. 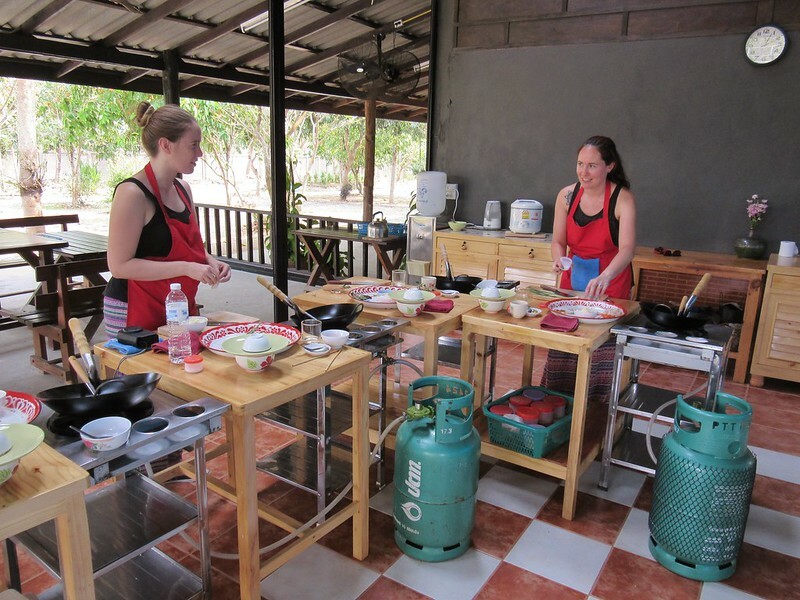 Not that it’ll be too relevant with camp-stove dining over the next year or so, but we learnt a few nifty Thai recipes that’ll impress in the future and that hopefully we’d be able to replicate for Warmshowers hosts at some point. 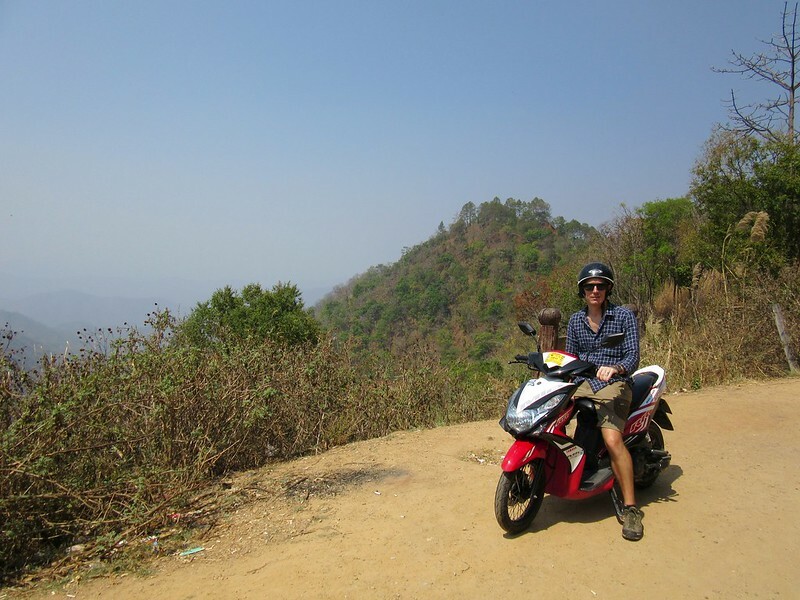 We also rented a scooter for a day and rode up into the mountains to the west of the city. 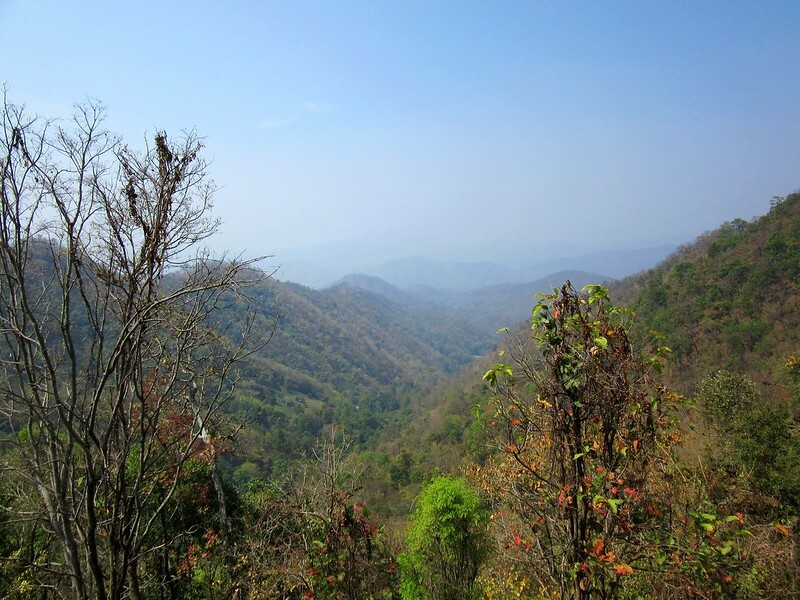 We did the 100km Samoueng Loop, stopping numerous times en route for photos, food and cold drinks. The hills were steep, our little 125cc engine was straining on a lot of them. We tried not to think too much about what it’ll be like to cycle them, we haven’t had any serious climbs for a long time! But the scenery was beautiful, and that’s always the payoff, plus of course the fun part, riding downhill on the other side. 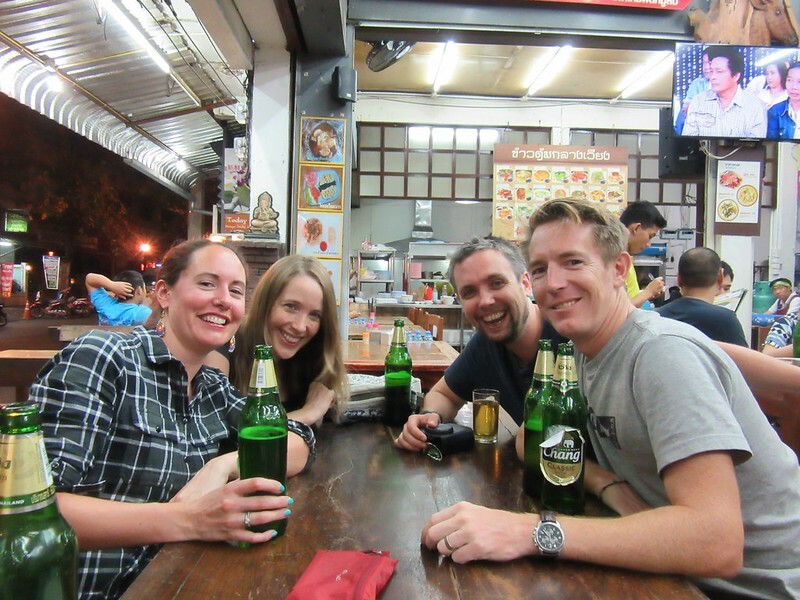 Most of the evenings we spent eating and drinking with Todd and Vicky (common theme there) and wandering the night markets. 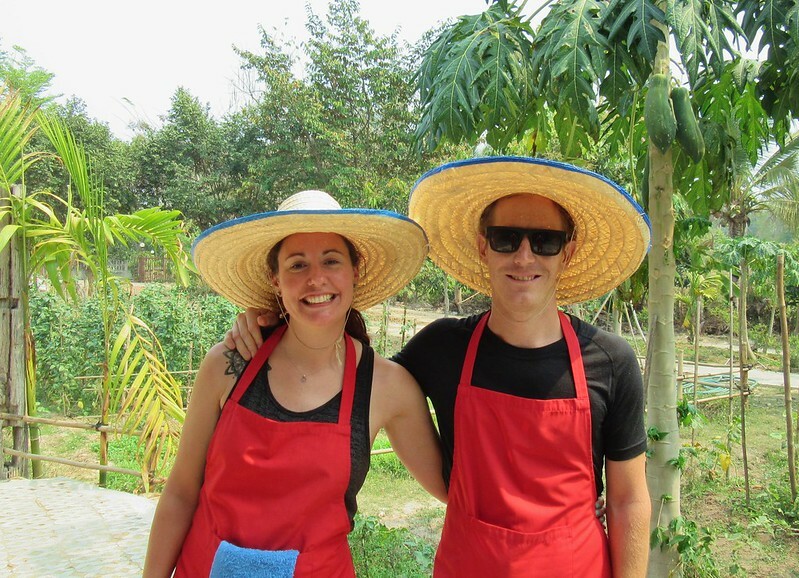 Just before returning to Bangkok we managed to meet up with my cousin Lizzi and her boyfriend John. She’s just finished a work placement in Hong Kong and is travelling for 6 weeks. We’d hoped we’d be able to catch her in Hong Kong when we were there, but the timings didn’t work out. 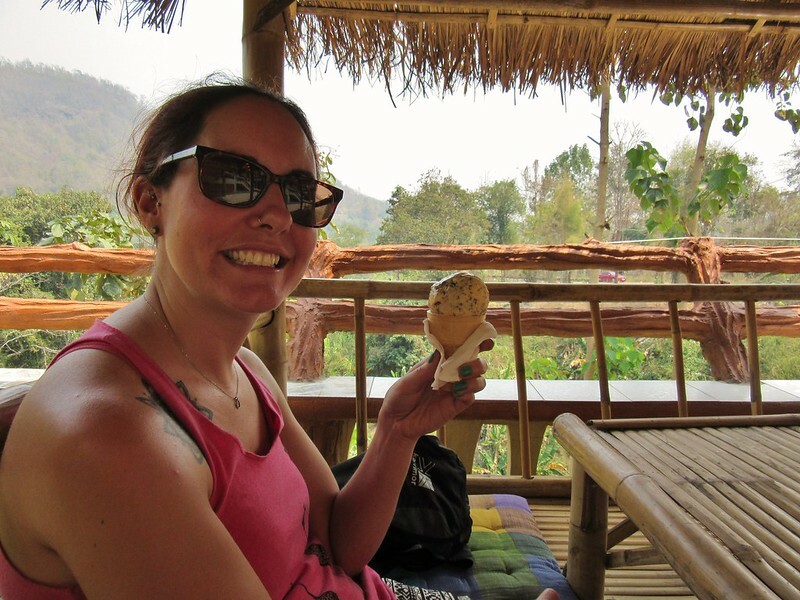 Luckily we overlapped in Chiang Mai for a few hours so we could have a quick lunch together before we jumped on the overnight train south. It was great seeing you Lizzi, glad we managed to meet up somewhere! 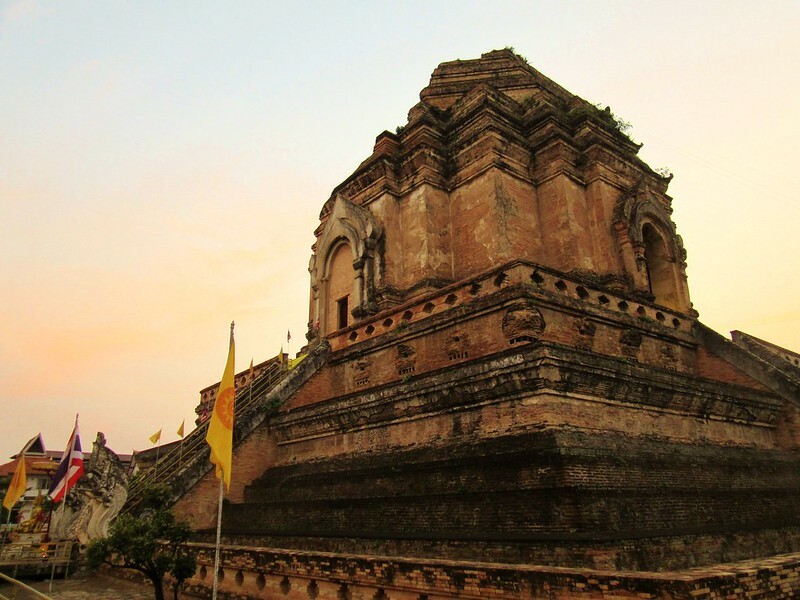 Chiang Mai is a cool place, the city centre is compact and enclosed by an old wall and moat. There are temples everywhere and countless restaurants and cafes. We could easily have spent longer there had we not had the small matter of a bicycle tour to return to. 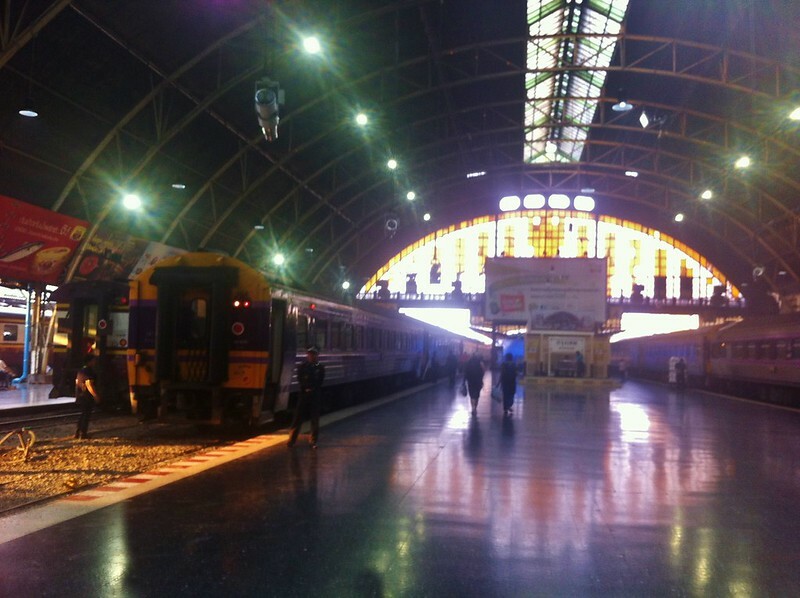 Back in Bangkok, we were back to the same hostel near the station that had stored our panniers for us. 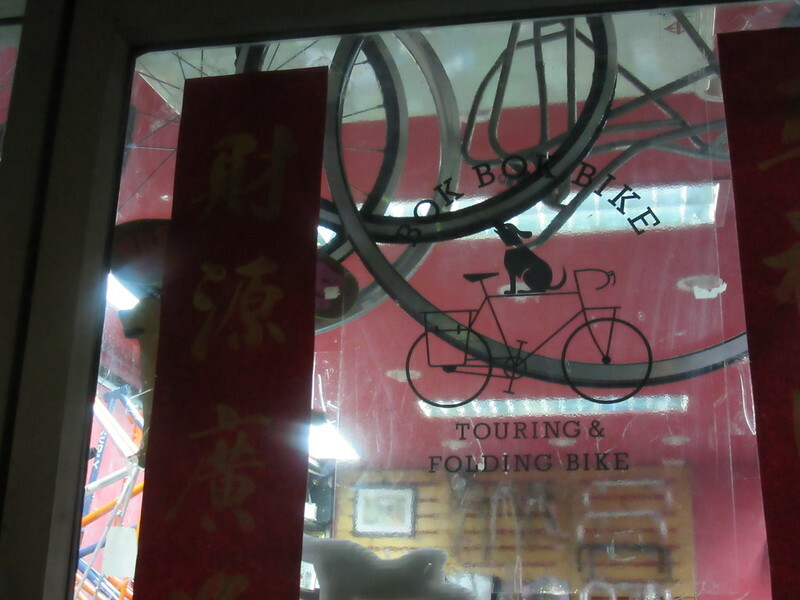 We heard from Bok Bok Bike to say our bikes were almost finished, but Clare’s needed a new rear hub. A pain, but better to know about it and get it sorted here rather than have it fail somewhere miles from a bike shop! We were still keen to head off the following day so they did the work that day for us and we picked our bikes up at around 8 that evening. 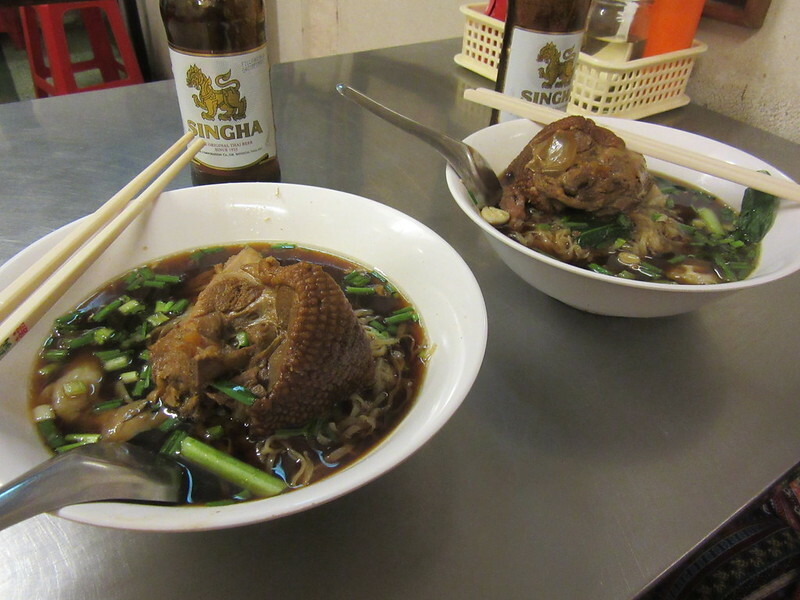 After a quick dinner in a market at what turned out to be a famous duck noodle restaurant, we cycled back to the hostel in the dark. From here it’s north towards the Laos border at Vientiane. We have a rough idea of the route and two weeks to get there before our visas run out. 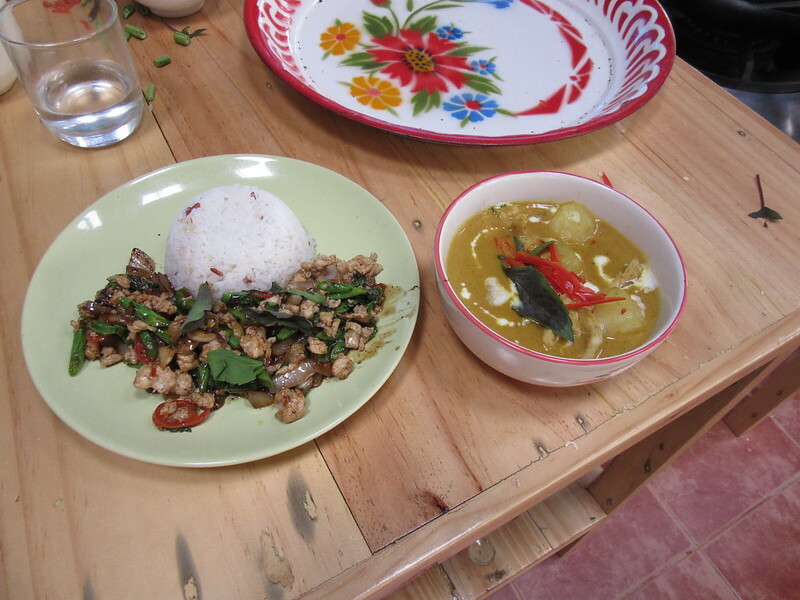 The guys at Bok Bok gave us a few tips for good roads to take and places to visit, but the first challenge tomorrow will be getting out of Bangkok. 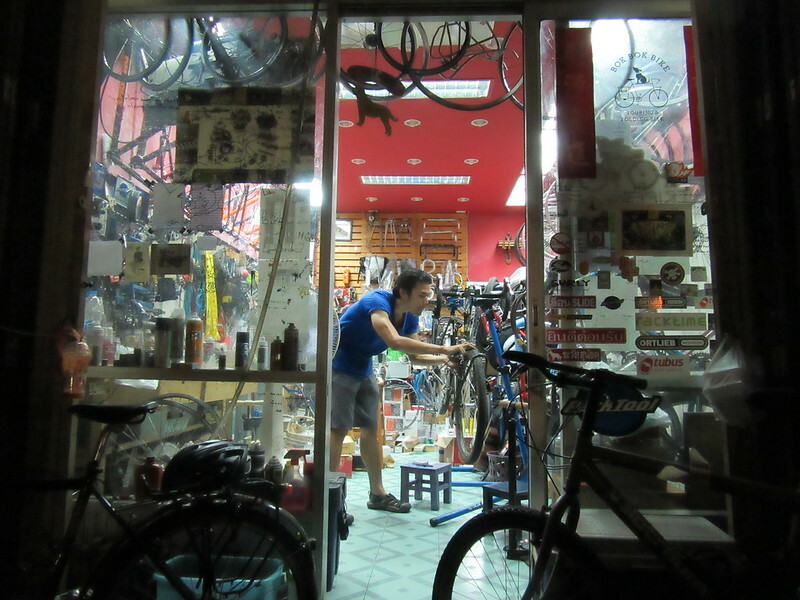 So glad you found a good bike shop in Bangkok. We had an unfortunate experience getting our bikes tuned up while there last year. VeloThailand was the name of that shop and I would let others know to stay away from them. Thanks for sharing your travels, always fun to see what you are up to. Safe riding! 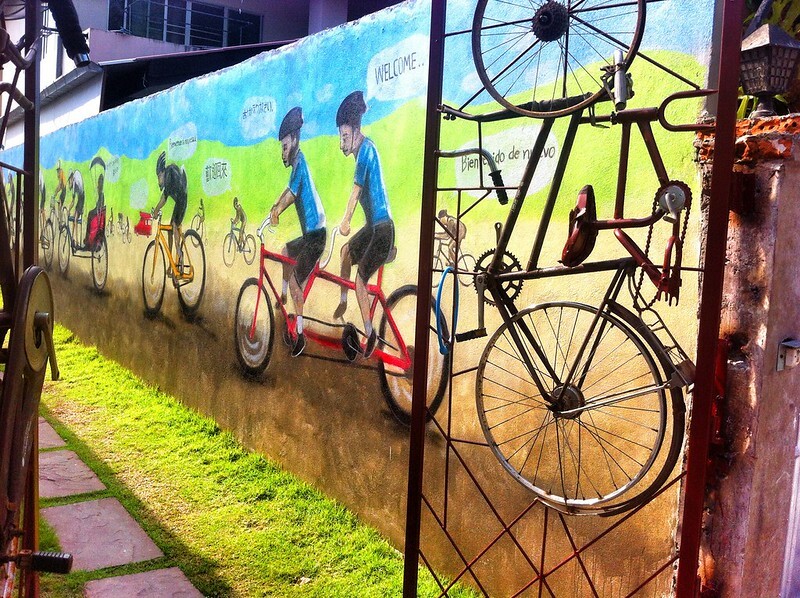 Just scanned through your Thailand entries and read about your experience with Velo! Doesn’t sound too professional at all! Bok Bok were really good and knew their stuff. Consequently, they’re popular, and so very busy! We were lucky to have a long time to leave the bikes with them, as they had a lot of other bikes that they were working on. Great Blog again. Have fun and hope the hills aren’t to much of a shock! Sounds like you had a great time in Thailand,took me back to,our recent visit and Ben’s wedding there. We cycled. From Barns Green To Cranleigh on the south downs link yesterday a mere 35 kilometres and one very steep hill where we had to push bikes, thought of you both,forever in ore of what you’re doing. Thanks Chriss. 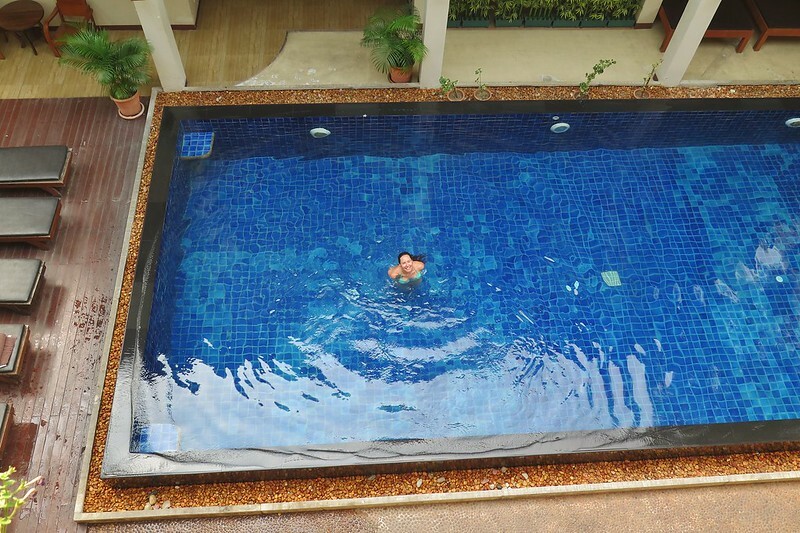 Yeah, we really are loving Thailand! I think I know that bit on the Downs Link! Past Rudgwick, towards Baynards, where it goes over the old tunnel? I remember riding up that as training for a ski season, it’s really steep!